The election of Hernández as president means a continuation of the policies that have driven the country into such disaster. As the candidate of the ruling National Party, and the president of congress during the last four years, Hernández is very much a creature of the conservative establishment. During his tenure in congress, he oversaw the creation of a new military police force, which was turned out onto the streets just before the election; as a candidate, he continued to beat the drums for security, promising to put a “soldier on every corner” and to pair soldiers with police for urban patrols. Meanwhile, his colleagues in the ruling National Party have promised to further open the country to foreign investment. The Economist reported that prior to the inauguration at the end of January, the National Party may push through a new round of cuts in order to qualify for a new IMF loan. And yet, if the election didn’t usher in the change for which many hoped, the story is nonetheless more complicated than presidential winners and losers. As much as Hernández intends to entrench the status quo, he will also be forced to contend with a changing country—one where he will face both a potent new political force, in the form of Castro’s party, LIBRE, as well as the urban and rural grassroots movements that have been pushing back throughout the country. “If we sit back and carefully study the result of these elections, I have no doubt that it is a triumph for LIBRE,” said Hugo Noé Pino, who is the former president of the Central Bank and Ambassador to the United States and who now supports LIBRE. Official results posted by electoral authorities gave LIBRE 29 per cent of the vote, and with it, almost a third of the seats in congress. The National Party claimed 37 percent, the Liberals claimed 20 percent and almost 14 percent went to the new Anti-Corruption Party. “This has no precedent,” said Pino. 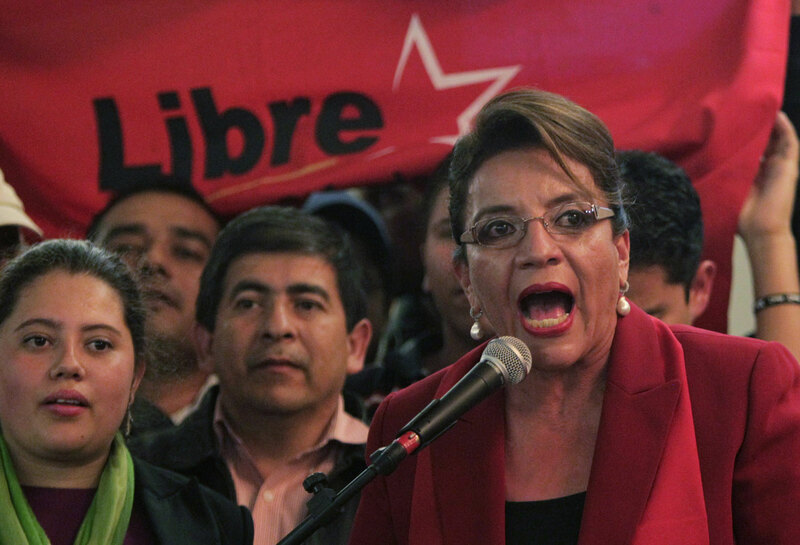 LIBRE, which stands for Libertad y Refundación, was born in 2011 when broad segments of the resistance movement joined with Liberal party members faithful to Zelaya. The ex-president, who had just returned from exile, became head of the party and his wife, Xiomara Castro, was selected as their candidate for president. LIBRE is a democratic socialist party, which promised voters a break with the past and a focus on education and health. In addition, the social-movement forces within the party proposed a “refoundational project,” which would include the writing of a new constitution. But there is another element to the changing political landscape in Honduras, and that is the role of the country’s grassroots resistance movements, which will not give up their struggles for land, fair wages and justice even after the last votes have been tallied. The country’s public sector is in turmoil, and while doctors and teachers are currently working, fresh strikes cannot be ruled out in the new year. Teachers constitute one of the largest sectors that mobilized against the coup and against the World Bank–backed education reform package. “The Fundamental Education Law has recently been passed, which amounts to the privatization of education and the removal of the rights of teachers,” said Carlos Amador, a teacher who represents 300 teachers in the municipality of El Porvenir, an agricultural area east of the capital. “One of the forms of reprisals against the teachers relates to our salaries. We are not being paid on time and months go by without pay.” The Honduran Teacher Federation says there are more than 14,000 teachers across the country who have not received their full salaries since 2010. Amador expects the teachers struggle to ramp up next year unless the new government scraps the recent education law. Doctors have also gone without pay, and many hospitals can no longer provide syringes and other basic equipment for patients. Doctors and other medical staff struck on November 5, voting by a slim margin to return to work the following week. But it is Indigenous and campesino peasant movements that are the most steadfast sectors of the resistance in Honduras, refusing to bow down even when faced with assassinations, threats and incarceration. The Chicago Religious Leadership Network on Latin America released a report documenting 229 politically related murders in Honduras since the outgoing president, Porfirio Lobo, took power after the coup. In addition, local campesino organizations calculate that more than 3,000 peasant farmers in Honduras are facing criminal charges linked to land struggles. One of the most watched rural battles in the country is taking place in the lush, forested valleys of the country’s mid-west, where an Indigenous community’s fight against a dam promises to carry on regardless of election results. “The Lenca people have taken the decision to defend the Gualcarque River against the construction of a hydroelectric project called Agua Zarca,” Aureliano Molina from the Civic Council of Indigenous and Popular Organizations of Honduras (COPINH), told a delegation of US election observers before the vote. Meanwhile, in the fertile Aguán region along the country’s north coast, peasant organizations have occupied twenty-six farms on 3,000 hectares of land. Since 2010, they count more than 113 assassinations of community members, some of which they attribute to private security working for palm oil magnate Miguel Facussé, as well as the Honduran Army. Some grassroots members of the Unified Campesino Movement of the Aguán (MUCA) ran for the LIBRE Party, but their key avenue of organization is in the physical occupation of unused farmland. Throughout the settlements, houses made of palm stalks and thatched roofs stand side-by-side with concrete homes with sheet metal roofs. Many of the 2,500 families participating in the occupations are without running water or electricity. Yoni Rivas, a MUCA leader who ran unsuccessfully for a congress seat with LIBRE, said his organization is concerned that if the National Party forms the next government it will annul signed agreements recognizing the peasants’ rights to land. “That’s one of the fears that we have, and hopefully that won’t take place,” he said, speaking over the noisy air conditioner in his small office in the occupation of La Confianza. The Aguán, like other conflict zones in Honduras, has been increasingly militarized since the 2009 coup. US Special Operations Command South are active in the Aguán and elsewhere, as is the US Joint Task Force-Bravo, which maintains a permanent presence at the Soto Cano base near Tegucigalpa. In August, construction on three new US naval bases along the north coast was announced. Eliminating drug trafficking has been used as the Pentagon’s justification for increased militarization, something critics say hides Washington’s true intentions. When the new government is inaugurated in late January, thirty-nine LIBRE congress people will bring a new voice into the halls of a congress previously dominated by two large parties.